Winter is a magical time of year in Europe, with fairytale, snow-topped castles and mountains, and a wonderful festive spirit everywhere. In Europe's Christmas markets the air is filled with the scents of gingerbread and warm, spicy glühwein, and the tunes of traditional carols can be heard around every corner. Experience the Christmas Markets and take advantage of this fantastic opportunity to sail on our beautiful new ships-the Viking Longships- during their inaugural season. 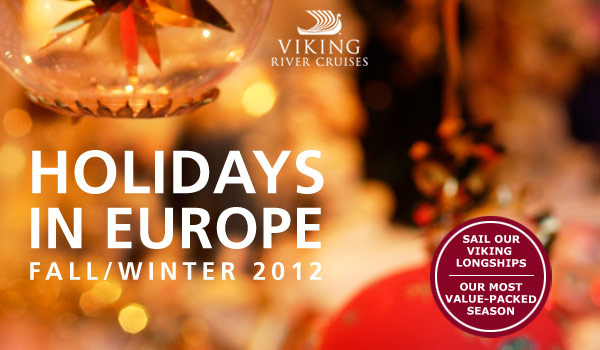 In 2012, Viking is introducing its Fall Celebrations cruise series. We invite you to join us in November when you can treat yourself, leave the cooking to us and come celebrate Thanksgiving with the Viking family. With a nod to a home-cooked meal, a traditional Thanksgiving feast-roasted turkey with all the trimmings-will be served on each November departure.